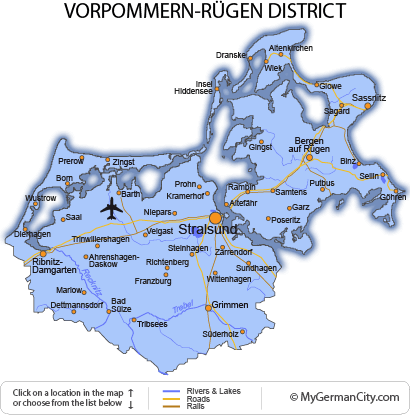 Right at (or in) the Baltic Sea is the flat expanse of the Vorpommern-Rügen District. Surrounding the district’s capital of Stralsund, the northern coastline is protected by a great peninsula, enclosing a long bay. Rügen itself, Germany’s largest island, has some of the best beaches in the country. The Fischland-Darß-Zinst peninsula is really three distinct areas which shelter the lagoons (bodden) they have created behind them. Locally just known as the Darß, this sandbank and the lowland territory are an excellent location to spot migrating cranes and geese — and have quite a large forest housing other wildlife. This entire area is part of the Western Pomerania Lagoon Area National Park. Rügen’s coasts and lagoons make up the Island’s Naturpark and includes the protected offshore Bioshärenreservat Südost and the National Park Vorpommersche Boddenlandschaft. It is also a great location for observing both migrating and endemic wildlife from the Baltic. Many of the fantastic seaside resorts, including Putbus, are connected to each other with the narrow gauge steam railway — affectionately known as Rasender Roland. Sassnitz has a large zoo and a floating submarine museum — the decommissioned HMS Otus — to explore. The largest of the resorts is Binz — and it has a little secret: a huge holiday camp-type complex sprawling along the coast. Built by the Third Reich, this huge and rather ugly “hotel” was built to house 20,000 German holiday-makers and is now protected due to its unique architecture.